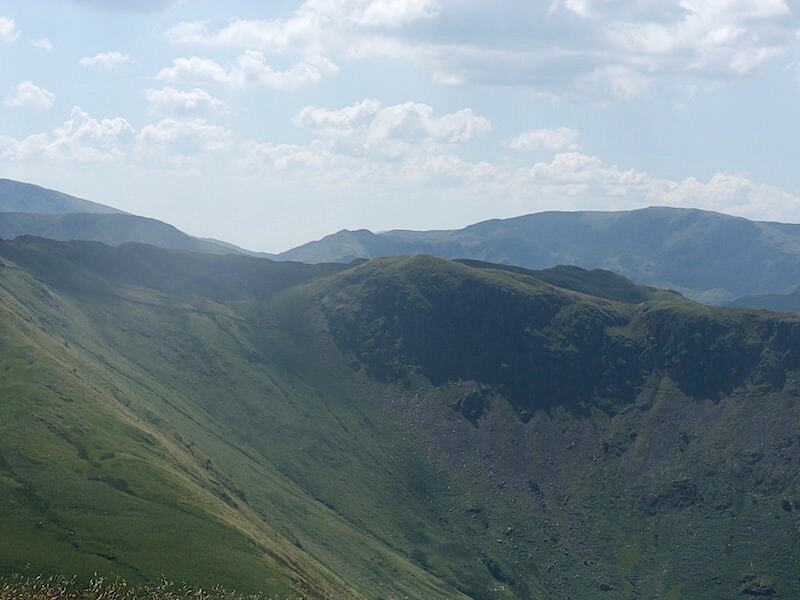 Various circumstances have kept us off the fells lately so we were pleased to have the chance to put that to rights today, especially as the forecast was a good one. It was one of those days which starts hot and just gets hotter and hotter. Of course we didn’t know that when we decided yesterday to have a walk up The Nab, or perhaps we may have chosen differently. 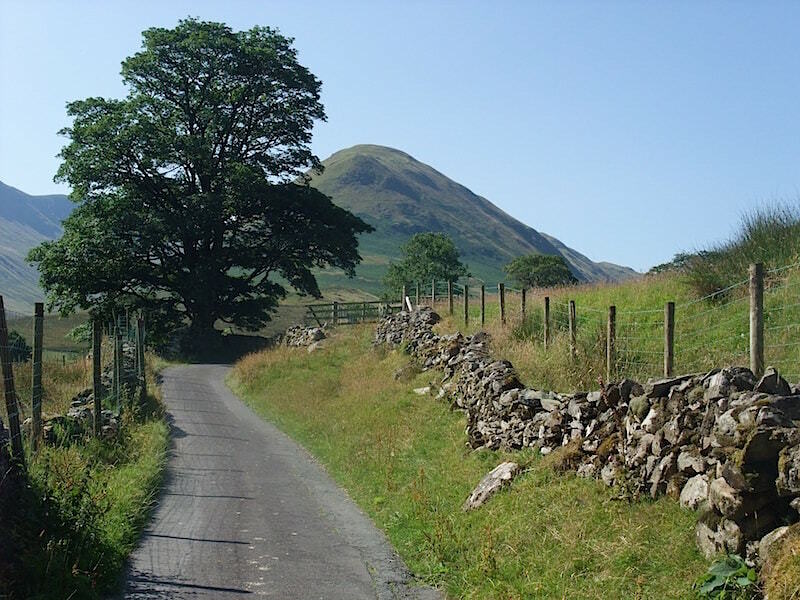 Anyway, be that as it may, off we went over to Martindale and parked up near the old church. 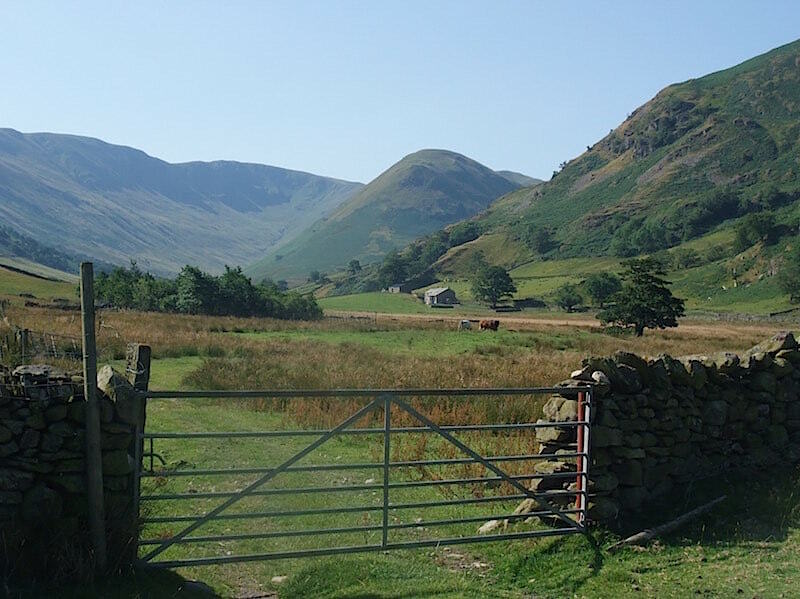 The Nab, in the centre, from Martindale Old Church. 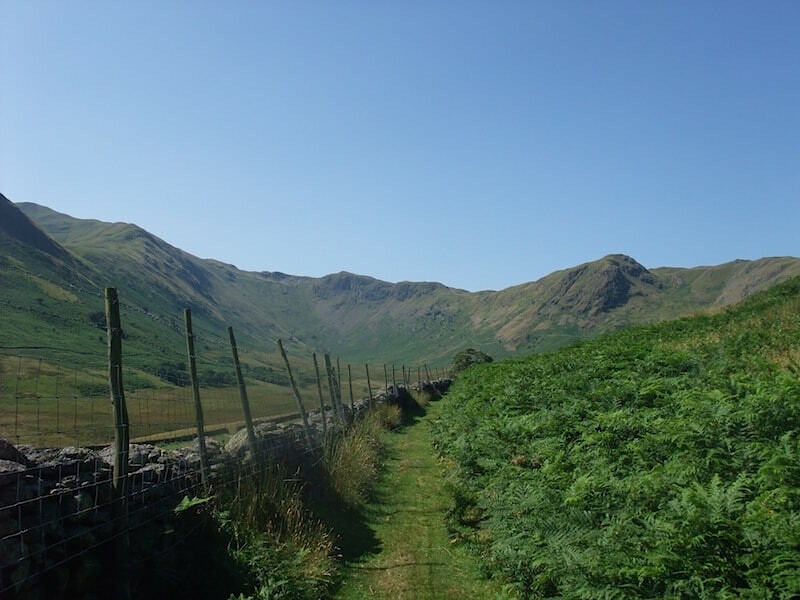 Hallin Fell on the left and Steel Knotts on the right from the walk through Martindale. 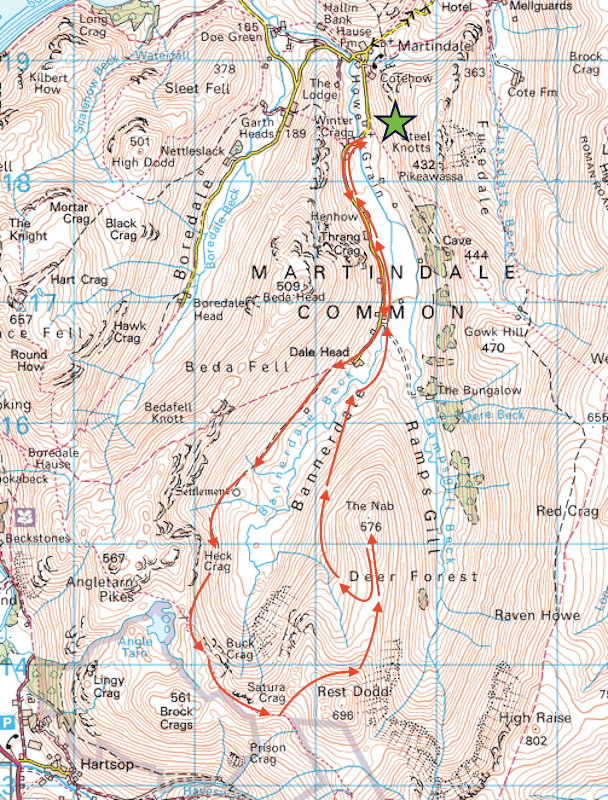 Looking ahead to The Nab. 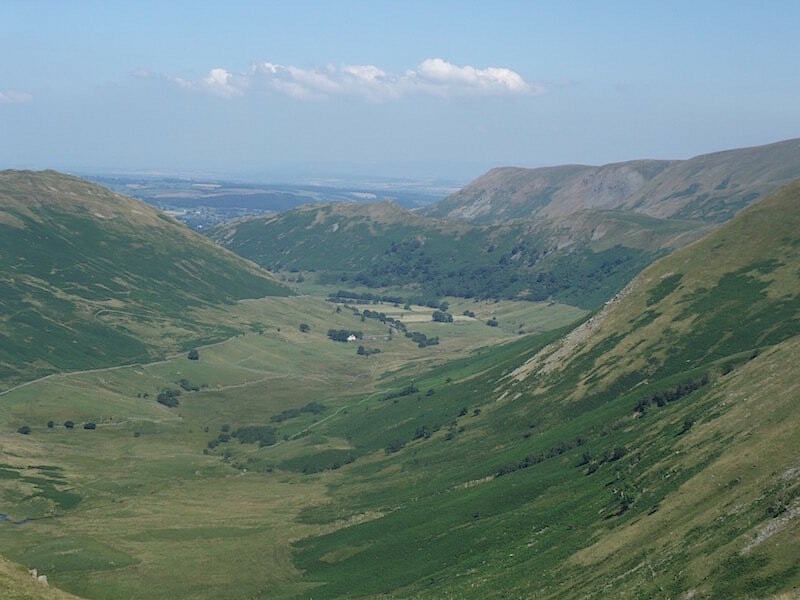 The Nab is a red deer conservation area and is said to be the home of the oldest native red deer herd in England. I was looking forward to seeing some and had brought the binoculars to get a good view of them. 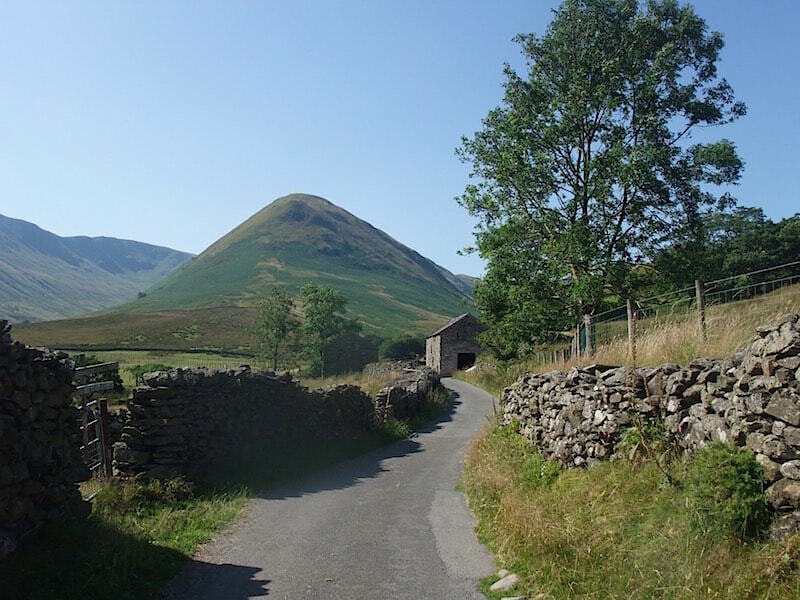 The tarmac road ends at Dale Head farm, from where we took the path along the valley bottom alongside Bannerdale Beck. 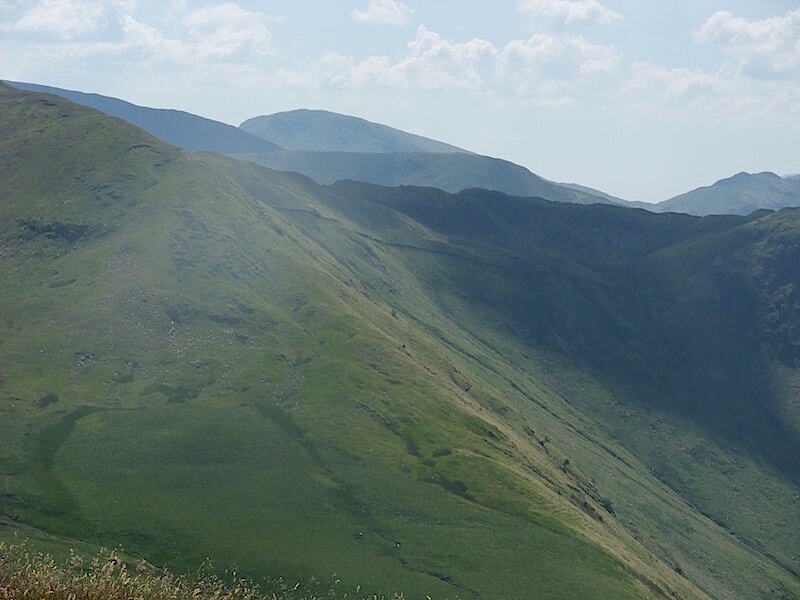 Here we’re looking towards the head of Bannerdale. Despite constantly looking across at the slopes of The Nab we couldn’t see any of the red deer at all. 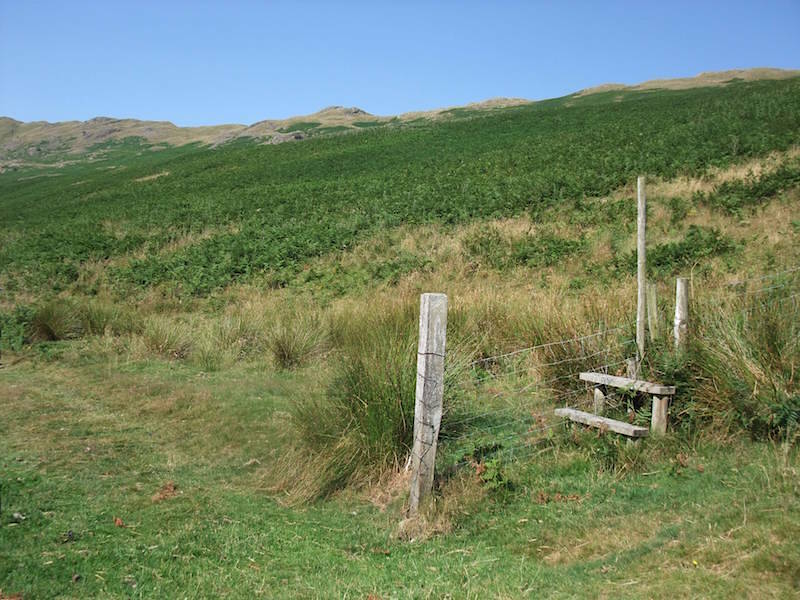 A fence and a stile looking for a gate. 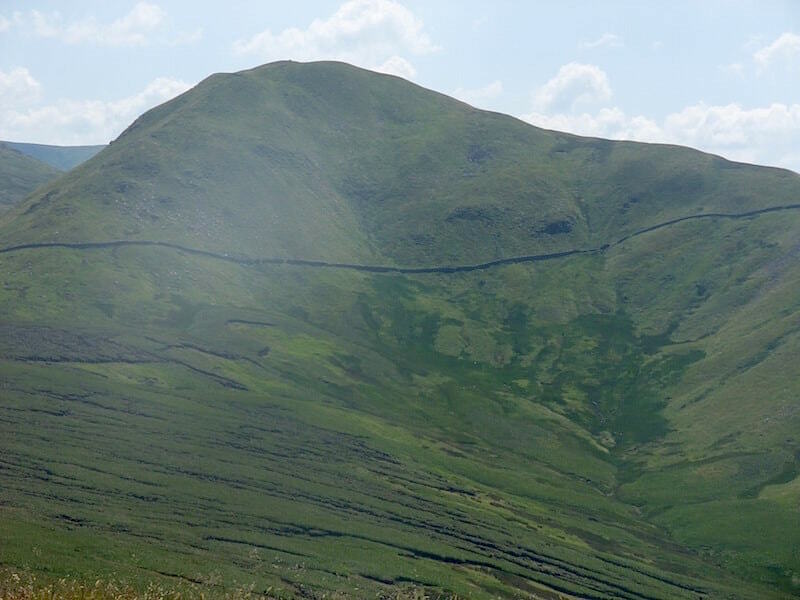 The head of Bannerdale. It had been a very pleasant, if rather warm, walk along the valley, but ahead of us we know there was some climbing to be done. That’ll mean quite a few brow mopping stops then. Following the wall to Heck Crag and then from there on to the lowest point on the skyline. 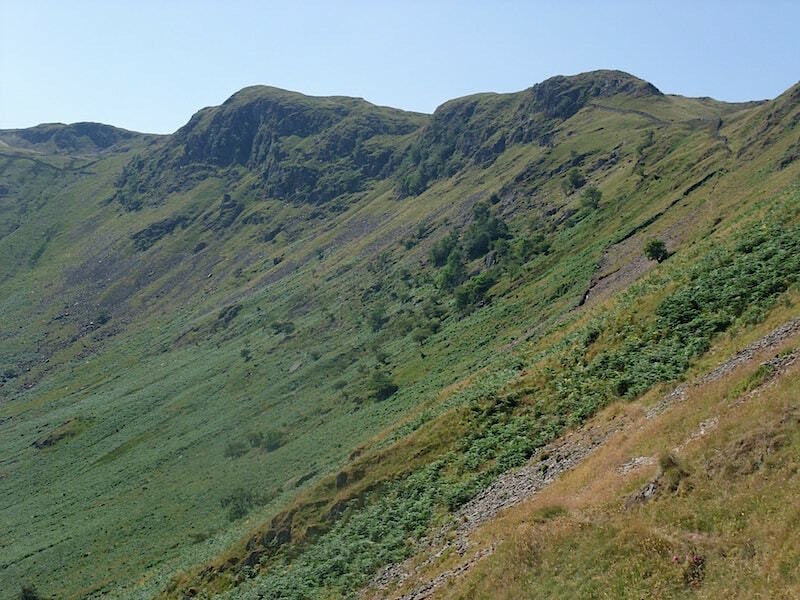 Buck Crag from the steep climb out of the valley, this was very hard work in the heat. It hadn’t looked too bad from the bottom and on a cooler day it perhaps wouldn’t have been quite such a struggle, the high bracken didn’t help either. 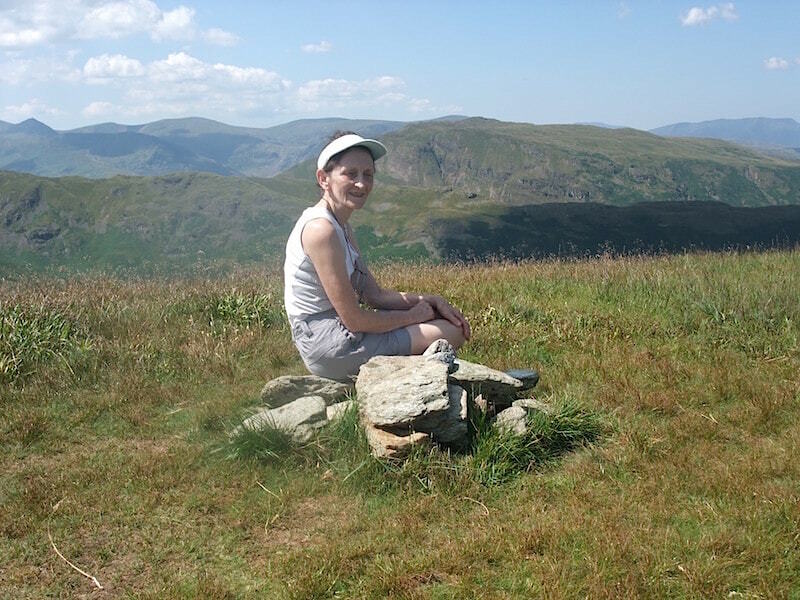 Finally we reach the top and the path joins another at this point overlooking Angle Tarn. This was the most welcome sight in the world at this point and we flopped down on the grass and treated ourselves to snacks, drinks and a jolly good rest. I think this is a lovely place, and where better to rest your weary legs for a while. 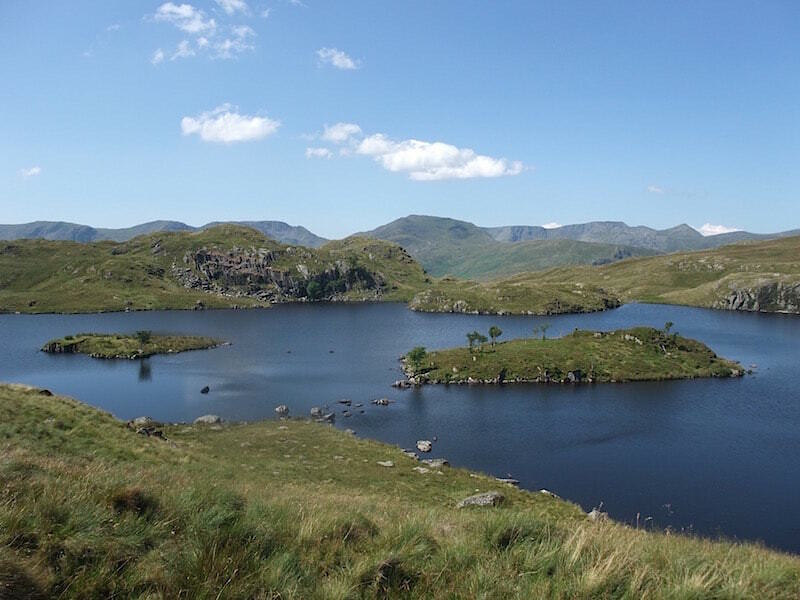 On the skyline behind the far shore of the tarn, from left to right, are Dove Crag, Hart Crag and Fairfield. It doesn’t look it but, not surprisingly, there were lots of people here today. Some just sitting like us, others paddling and swimming, and on the little peninsula, over on the right, people camping. You can just about make out their little green tent on the end of the peninsula, but I don’t think you’ll be able to see the bikini clad sunbather beside it. 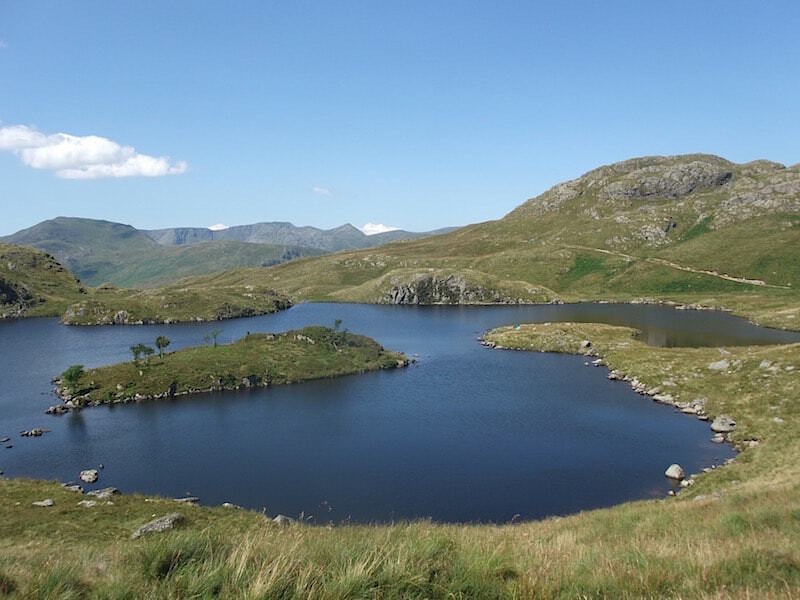 Angletarn Pikes above Angle Tarn. The speck of blue over on the right hand shore is a couple of people preparing for a swim. One jumped straight in, and got it over with, the other crept in bit by bit and kept shrieking as the cold water hit hot skin. 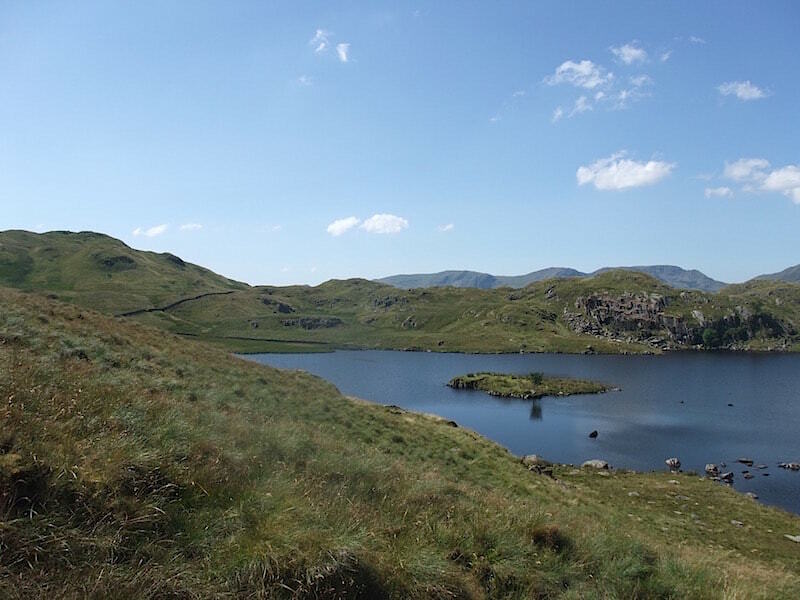 Suitably refreshed we leave the tarn and make our way over towards Rest Dodd. Here’s the view down Bannerdale as we cross over Satura Crag. 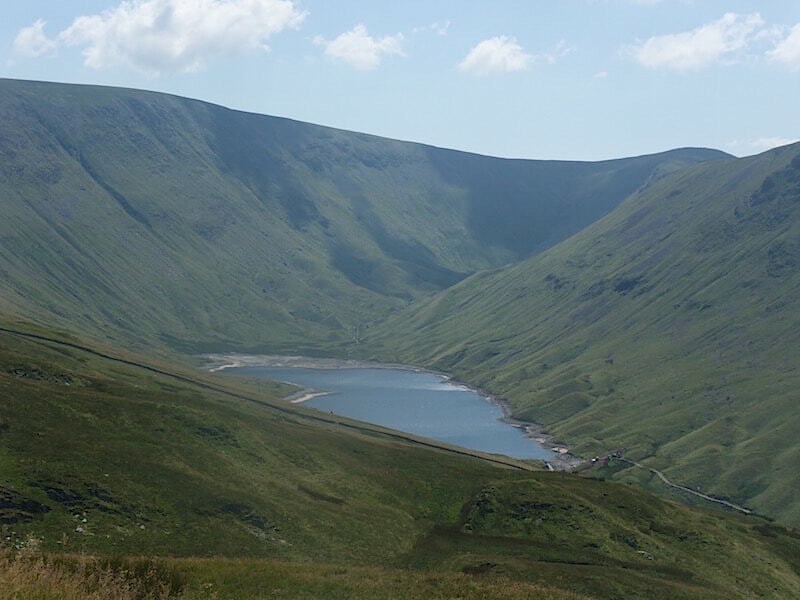 Hayeswater with High Street beyond. Work is progressing at the outflow end of Hayeswater where the dam is being removed now that this will no longer be used as a reservoir. Looking ahead to crossing The Nab, no problems with the peat hags, they were nice and dry thanks to the lack of rain recently. A lone walker ahead of us is already making the crossing. No need for wet weather gear today, its seriously hot now. 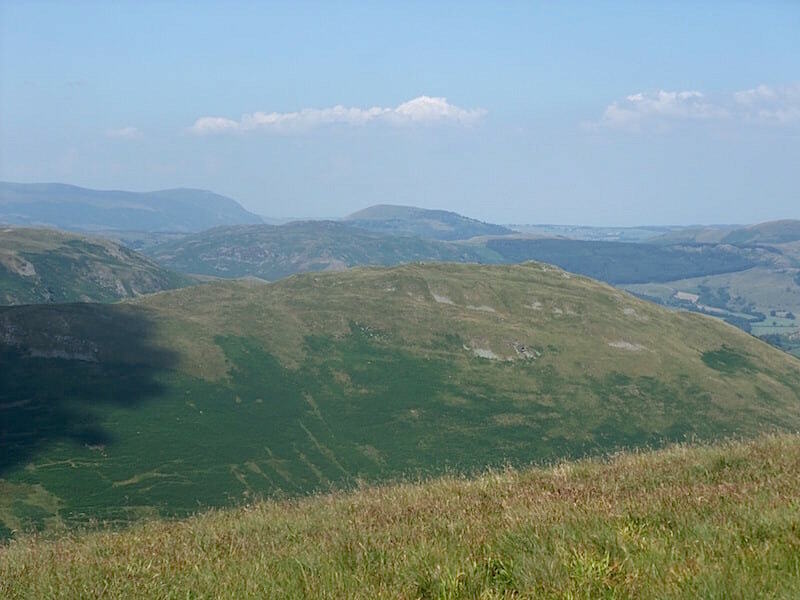 Across the valley from us are the green slopes of Beda Fell with Great Mell Fell, the little rounded hump, on the centre skyline. 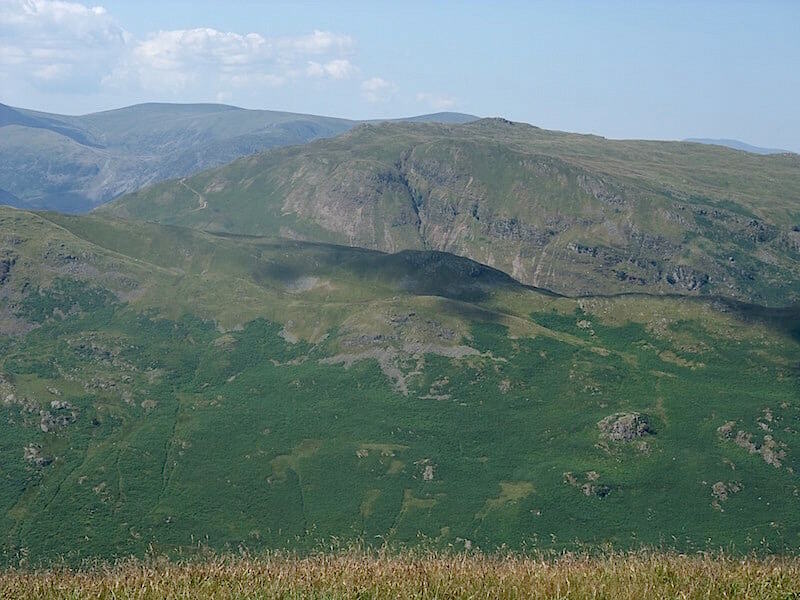 A little to my left, over the bracken covered slopes of Beda Fell, is Place Fell, and just peeping out above the top of Place Fell is Great Dodd. 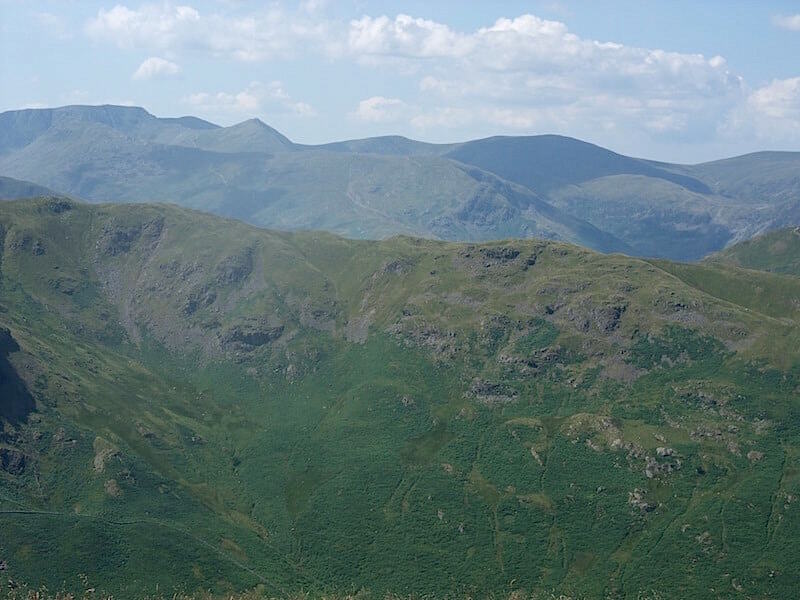 Layers of fells to the west of us, Catsty Cam is the pointed one on the skyline. Below Heck Crag is the wall we followed earlier on through Bannerdale. The bracken along the length of it was a bit of a nightmare to push through. 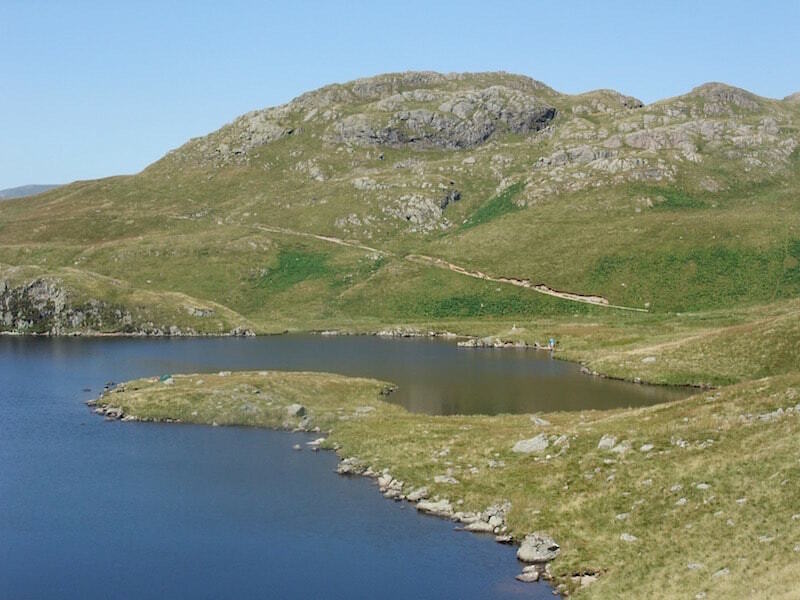 The wall continues beyond Heck Crag and rises very steeply up to join the path around Angle Tarn. No wonder we had to have plenty of stops for brow mopping. If you look closely at the bottom of the large U-shaped dip on the skyline you will see a faint shape just peeping above it. 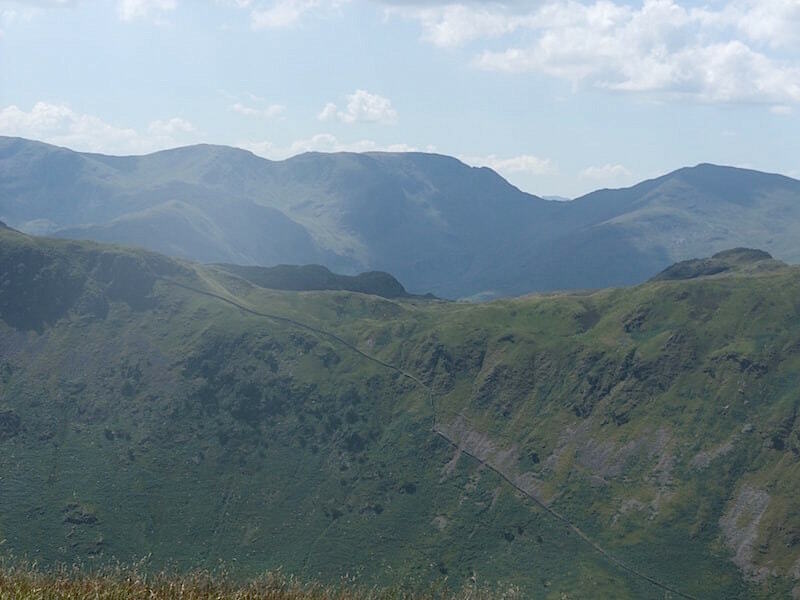 I have it on good authority that the faint shape is Scafell Pike, the good authority being AW himself and if he says its Scafell Pike then that’s good enough for me. I think its about 14 miles away from us as the crow flies. 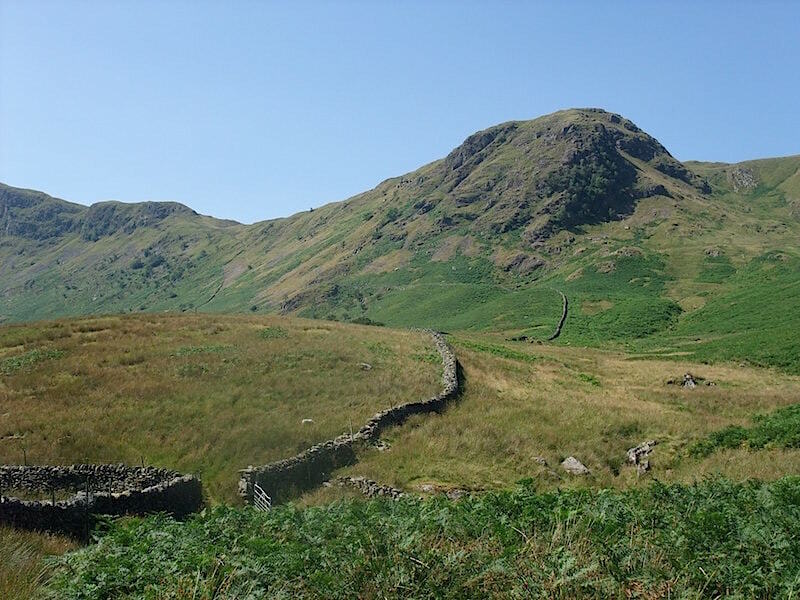 Buck Crag at the head of Bannerdale. 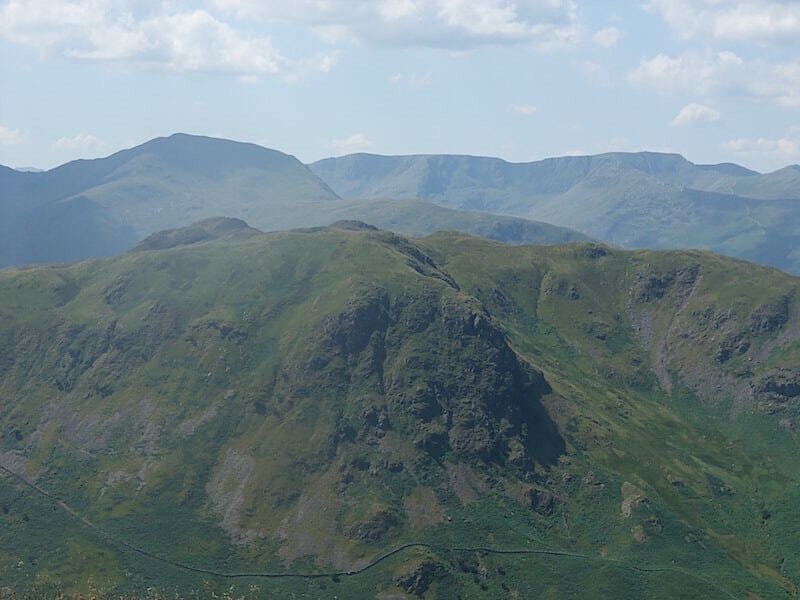 More fells on view looking south from The Nab, the highest one being Red Screes in the centre. 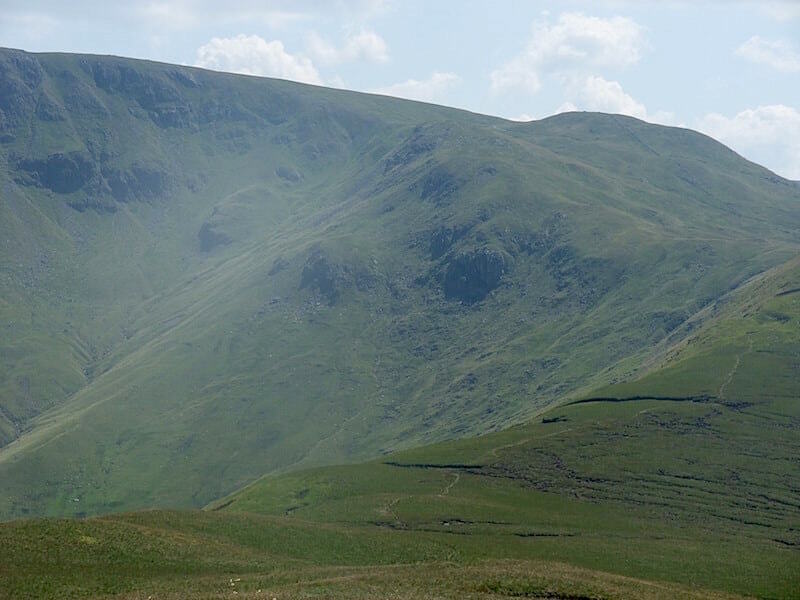 Looking back across to Rest Dodd and the wall we followed across to The Nab. 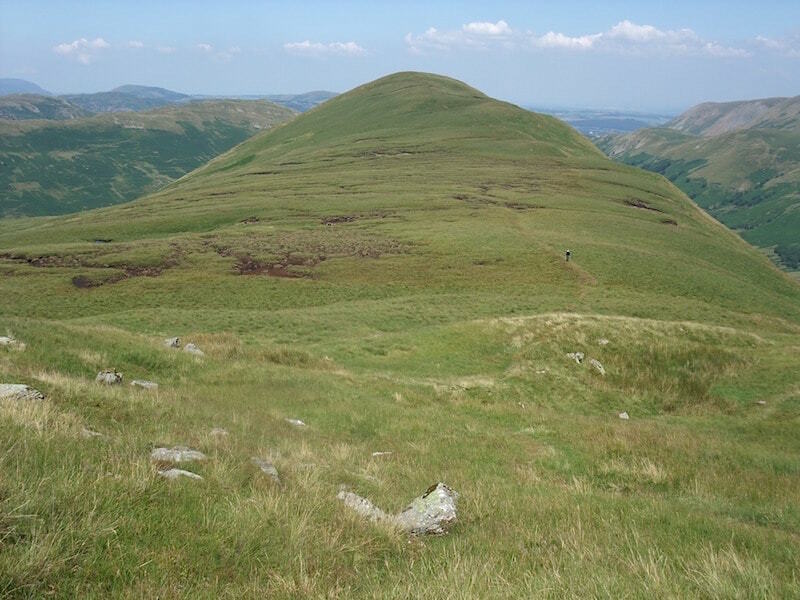 Looking across to The Knott over on the right of the skyline and Ramps Gill on the left of the shot. 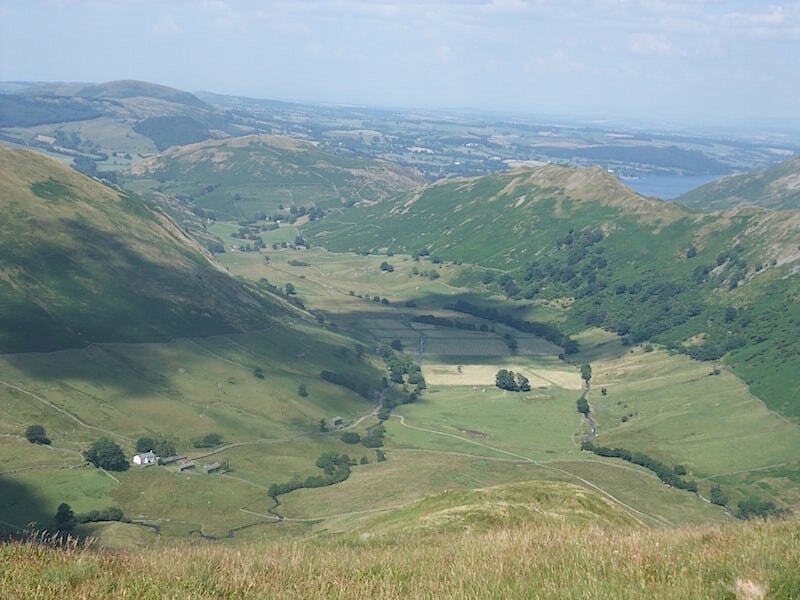 The view down Bannerdale from the end of The Nab, Ullswater just visible on the right. 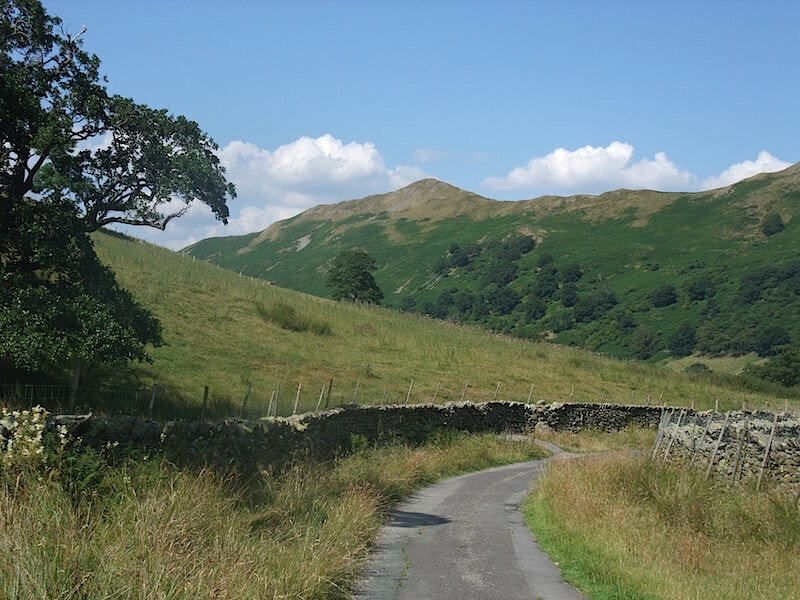 The white building over on the left is Dale Head farm where the tarmac road ends. Some discussion about the route of descent here but we eventually decided to double back along the plateau to reach the flatter section in the middle. 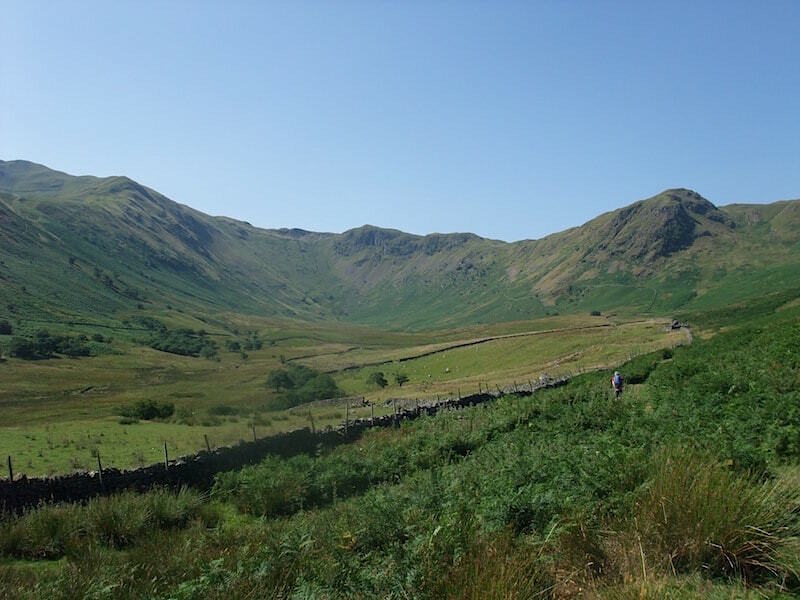 From there we did a steeply descending traverse along the fell side back down to pick up the road below Dale Head farm. Let’s just say that it was an interesting descent where five points of contact were better than two for a good part of the way down. All of it on grass, have you ever tried washing grass stains off the seat of your pants? It will not budge. No red deer were harmed or disturbed while we were on or descending The Nab, just in case you were worried, we never saw one all day, not even in the distance. They must have found some nice shady spots somewhere and waited until the sun was a bit less blistering. 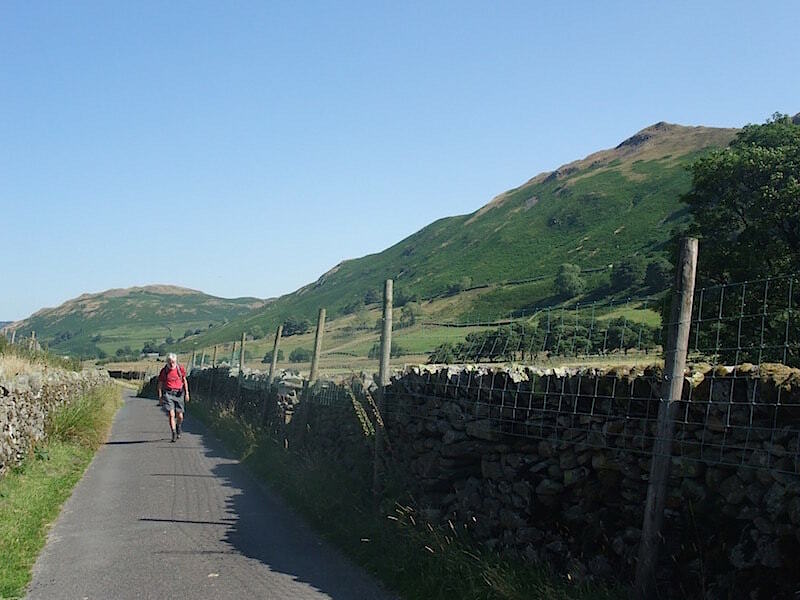 Safely back down onto the tarmac road with Steel Knotts on view as we walk back down to Martindale. 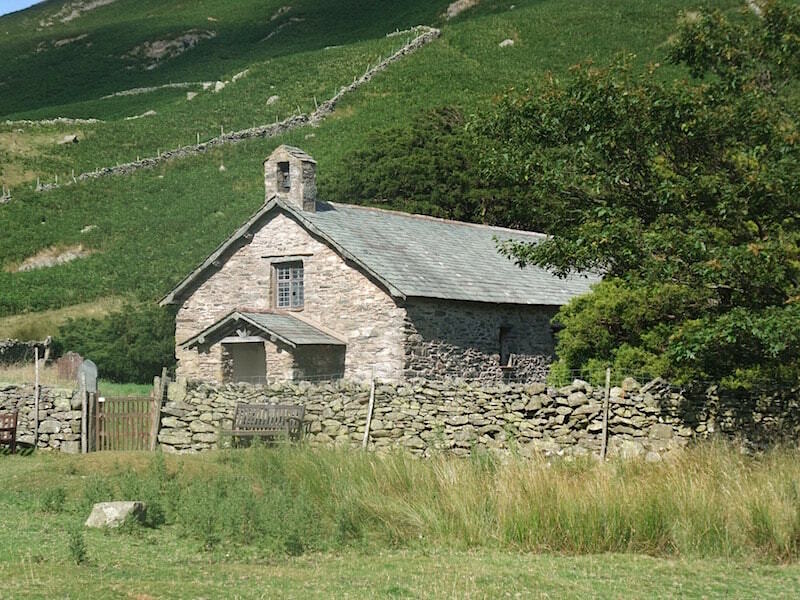 Finally we’re back where we started at the old church in Martindale. 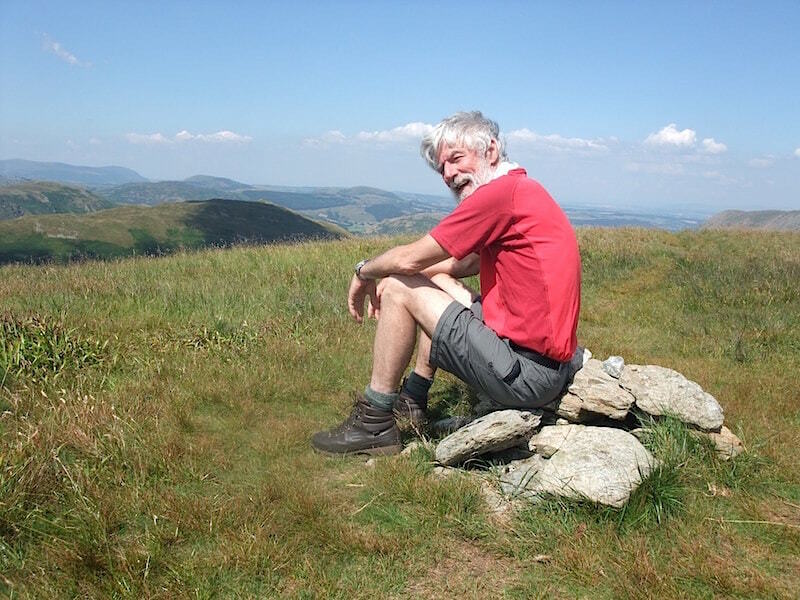 Apart from not seeing any deer, that was a grand little walk and it was absolutely great to be out on the fells again in such fabulous weather and after such a long absence.